This ring is a HOOT! This 14K yellow gold owl ring is made from Harmony Metals and is available in sizes 4 through 9. 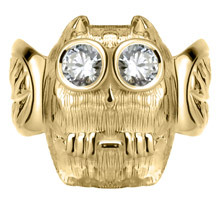 This version has two .25 carat diamonds, each with H-I clarity and I1 color for the owl eyes!